The Crested Butte Titans boys’ basketball team put together its best half of basketball ever en route to a 36-point win over the Ridgway Demons on Friday, January 25. In fact, the Titans looked so comfortable on the court that night that at times they flirted with Harlem Globetrotters’ panache, passing the ball to each other through the legs and behind the back in traffic for buckets in the paint. It all started on the opening possession for the Titans when junior John Wright buried a three-pointer from deep in the corner. Wright followed up with an offensive rebound and bucket on the Titans’ next possession and then fed junior Robbie Holleran on a give-and-go for the third straight Titan basket in as many possessions. Wright would go on to score 11 of his team-leading 22 points in the first quarter alone, as the Titans jumped out to a 23-9 lead in the first quarter. Wright opened the second quarter the very same way, sinking a rainmaker three-pointer. Holleran joined Wright from behind the arc as senior Randy Evans battled under the basket, scoring 13 points in the second quarter. The Titans took a 52-15 lead into halftime, causing a stir among the crowd of a 100-point night, but coach Robin Loyed took the opportunity to work his bench players into the game to gain the all-important varsity game experience. The shelling subsided somewhat in the second half but the Titans did manage to score what may be the most points ever by a Titan team, as they finished the night with the 78-42 win. 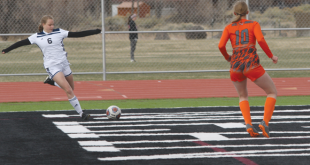 The team faced a stout challenge the following day as they hit the road to play Vail Christian on Saturday, January 26. Not only is it a long bus ride but the Titans were down to six varsity players for the game. Despite the depleted numbers and bus ride, the Titans didn’t miss a beat on Saturday, jumping out to a 19-point lead by the second half. 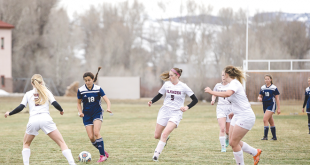 The wheels fell off the Titan express temporarily as Vail Christian hit Crested Butte with a combination of presses that rattled the Titans. Vail Christian cut the Titans’ lead down to nine points in the fourth quarter before the Titans saved the win, shooting 10 for 12 from the free-throw line in the final two minutes to exit Vail Christian with a 56-41 win. Wright led the Titans with 23 points in the game and Evans threw in eight points and pulled down 11 rebounds. The Titans will hit the road this weekend to face their toughest league rival, Ouray, on Saturday, February 2 at 4 p.m.